In my last column, I wrote about how to get started on your A-pillar speaker build, and before that, I focused on kick panel speaker mounting applications. In the a-pillar article, I concluded with encouragement for the reader to get a reference for future listening tests, for there is no substitute for the visceral impact and emotion of live music. This article is the first of at least three articles on the subject of tuning your mobile audio system. So without further ado, let’s dive right into the nuances of time domain adjustment, or ‘time-alignment,’ as it’s been coined many years ago by the first pioneers of time-aligned loudspeaker crossovers. Before I dig in, I’ll remind the reader that are no “laws” in car audio, and although what I present below has worked in the lion’s share of the hundreds of cars I have tuned for organized car audio competition, YOUR car audio system and/or experience may be vastly different. To begin, I’d like to introduce the two types of time-alignment of speakers: electrical time-alignment and mechanical time-alignment. If you’ve ever been to one of my Sound Quality Summit training seminars, one of the afternoon segments focusses on identification and classification of both mechanical and electrical problems; all problems in car audio can be divided into one of the two, and identifying them properly allows us to better evaluate potential solutions. Time-alignment is no different, and believe it or not, the vast majority of time-alignment ‘problems’ in a car are the result of mechanical ‘problems’ in one’s installation, including inadequate speaker mounting techniques and locations, distances between speaker pairs in multi-way systems, the disparity in speaker diameters, reflections, acoustical phasing anomalies, and the list goes on and on (there are some electrical reasons for time-alignment irregularities too, but for the sake of simplicity and brevity, I’ll focus on mechanical reasons in this article). Being a little bit (OK, maybe a lot) old-school, I always endeavor to fix mechanical problems with mechanical solutions. I try my best to optimize path length differences (discussed in detail in the kick panel article a few months ago), distances between pairs of speakers in a multi-way system, distances of speakers from each other on the same side, time offset between drivers of differing sizes and moving mass, time delay associated with certain box designs, physical location of subwoofer systems, abating early reflections, and etc. But sometimes we need electrical/electronic help in the form of digital signal processing, because it is a car after all, and there’s only so much you can do, within reason, to optimize a car mechanically. A perfect example of this is the time-alignment of subwoofers in a car, and that’s where we’ll begin with this segment. Sadly, unless you’ve done a full custom dash build, or have managed to cut your kick panels or floor well out, your subwoofer(s) are probably behind you in the trunk/boot. That’s OK! Some of the best, most competitive car audio systems have used trunk-mounted subwoofers. Overcoming the mechanical problems associated with this mounting location using better mechanics and good electronics makes this a viable choice for subwoofer location, provided a few things are kept in mind! Simple speaker location geography pretty much ensures that the substage in a normal trunk installation is further away from you than your front speakers. In most normal trunk and hatchback cars, the substage is two to three (or more) meters behind you, while the front stage can be as close as a meter or a meter and a half in front of you. Unless there’s a compelling reason to align the relative phase of the substage with your front-mounted midbass (phase is time and time is phase), you should almost never need time delay your subwoofer(s). This is a very common problem I see when tuning a previously-tuned or DIY audio system: nine times out of ten, the substage has more time delay than the front stage. Given the physical offset of the subwoofer(s) being further away from you than the front speakers, adding time delay to the sub(s) might exacerbate this phenomenon, even more, thereby creating “slow bass,” where there is a large, sometimes audible delay between the front speakers and substage. This phenomenon is easily identified by the midbass to sub-bass transition where, for example, you’ll hear the slap of the kick drum in your midbass and the thud from the substage sometime later. In the extreme case, there are two distinct tones of different spectral content that move from the front of the car to the rear, separated by time and location. Subwoofers are heavy – often a lot heavier than your front stage speakers, even including large-diameter midbass drivers. This is a Thiel-Small parameter known as moving mass, denoted in technical bulletins and user’s manuals as “Mms.” Using Hybrid Audio Technologies speakers as an example, a 12-inch diameter Clarus C12SW subwoofer has a Mms of 125 grams; fairly light by 12-inch subwoofer standard. Conversely, the Legatia L6SE 7.1-inch midbass has a Mms of 13.4 grams. You can see the obvious disparity here – 125 grams to 13.4 grams – almost an order of magnitude difference! Now imagine the Legatia L3SE 3-inch midrange/full-range driver, which has a Mms of 2.46 grams; the 12-inch subwoofer has almost fifty-one times the moving mass of the 3-inch midrange/full-range! The biggest offender of all can be subwoofer enclosures. Subwoofer enclosures can add markedly to the time-domain phenomenon, often in a very negative way; they too cause group delay, and sometimes it can be quite high. For example, in a quick popular literature search, I uncovered simulations that managed to achieve a group delay of 55ms at 18Hz in a very large sealed enclosure. More exotic enclosures, such as vented and bandpass enclosures offer similarly high group delays. To conclude, most car audio systems benefit, at least empirically, by having the front stage delayed to the substage. In my experience, the substage is very rarely time delayed, and when it is, is often in an effort to mirror the relative phase with the front stage as best as possible. Alas, there are always trade-offs. 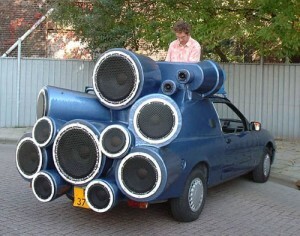 But that’s half the fun of car audio – the joy of experimentation! Join me next time for part two of this series, tuning front stage time-alignment! A great article, that will help those who are struggling to find that sweet spot. But I do agree with you that mechanical install is key, I believe my front mid bass could sound even better if put it in sealed custom enclosure and raise higher up than the kick panel.